Limeridge Hotel Lekki is an affordable 3-Star hotel situated at 10 Chevron Drive, Northern Foreshore Estates, Lagos. A walking distance from Chevron and surrounded by the famous Alpha beach and the Lekki Conservation Centre. It boasts 85 luxury rooms and suites divided into categories: Classic Queen, Superior Queen, Classic Queen, Classic King, Executive Room, Royal Family, Royal Suite and Royal King. 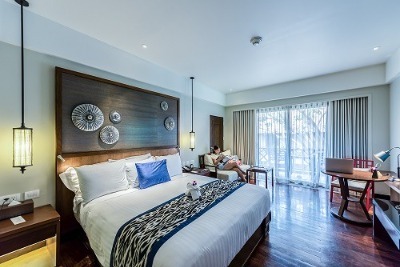 The rooms here have bathrooms en-suite and refrigerators, free Wi-Fi connection, cable TVs, room safes, lampshades and workstations. Connecting/adjoining rooms are also available. Limeridge Hotel is renowned for its ultimate designer decor and high-quality amenities. The onsite restaurant has a variety of exquisite continental dishes and Chinese Cuisines that can be enjoyed with the option of room service. Drinks, both alcoholic and non-alcoholic, can also be ordered from the bar. Some of the other hotel facilities include: Indoor and outdoor pool and a hot tub Jacuzzi, Gym/ Fitness facilities, Spa area, parking and 24 Hours power supply. Limeridge Hotel has state-of-the-art event facilities suitable for conferences, birthdays, meetings. Some of the event facilities are: Ultra-modern conference halls & board rooms with projectors, mobile screens and Public Address Systems. Limeridge Hotel makes use of CCTV Security Cameras and is guarded by professional security personnel. Limo or Town Car services are easily at the disposal of all guests. Alongside the English or African breakfast, toiletries, and daily newspaper delivery services, Limeridge Hotel also offers laundry, dry cleaning services, luggage storage, 24hrs room and desk services.The facilities are all wheelchair accessible. Cancellation: Cancellation policies vary depending on the room. Q: Does Limeridge Hotel offer free Wi-Fi? Q: Does Limeridge Hotel have a swimming pool? Q: What is the check in and check out time at Limeridge Hotel? Q: Is there a fitness centre/gym at Limeridge Hotel? what type of equipment are available? A: Yes. There is a gym at the hotel. Q: Does Limeridge Hotel have a restaurant? A: A restaurant is available at Limeridge Hotel Lekki. Limeridge Hotel is a budget hotel in Lekki, Lagos. I am very disappointment with the level of service I received at Limeridge Hotel, there was no internet service all through my stay and when I complained about it, I was not given a reasonable answer. To crown it all up, the receptionist on duty was very nonchalant in answering to requests made by guest. My experience at the hotel was not a bad one, I had a room that was big with a lovely bed that I liked because the sheets laid on it was very clean and well ironed. The only issue I had was that there were no adequate toiletries in the toilet. My stay was very okay. No complaints and no regrets! I had a fantastic experience. The hotel was really enjoyable. Nice reception, beautiful room and it is very spacious. The staff were really nice and well trained, they really made me feel comfortable. They had a very big parking space where I parked with adequate security. I enjoyed my stay at the hotel. The environment was serene and cool. The reception I received was nice. The room was well cleaned and maintained with the bathroom too. The available facilities were i good working condition. Nice stay! Have nice pictures of Limeridge Hotel?